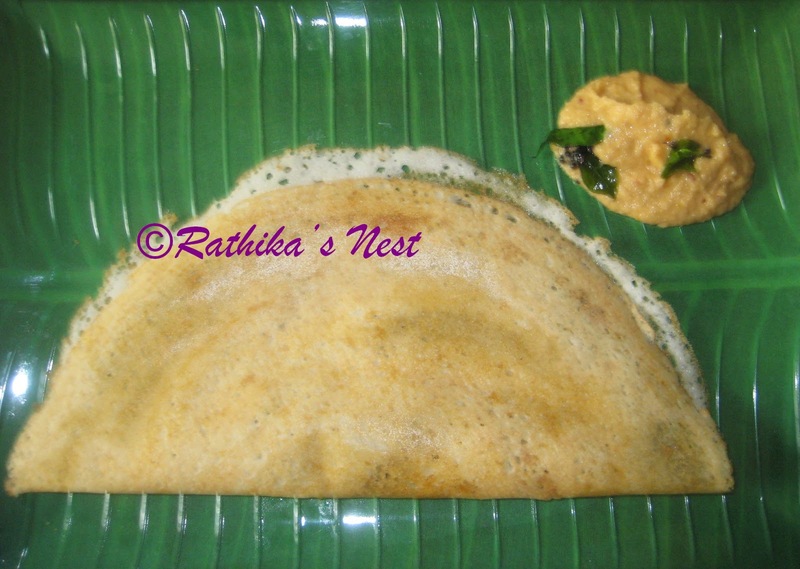 Dosa is one of the most common breakfast preparations in South India. Dosa contains carbohydrates and proteins. It is believed that vitamin content (B & C) of dosa is increased by the fermentation. Children often prefer dosa over idly. Dosa is made using a dosa tava – a round griddle, which is slightly hollow at the center. It is made of cast iron or aluminium, with or without a handle. Note: Ingredients mentioned here make approximately 40 dosas. Please note that the number of dosas depends on the dosa tava you use and size of the dosas you make. How to prepare the batter: Wash par-boiled rice, and urad dhal along with methi seeds separately. Soak them in sufficient water using different containers, for 4-5 hours. Grind urad dhal and methi seeds using a wet grinder, till the batter becomes a smooth spongy mass (நன்கு குடைய அரைக்கவும்). Transfer the dahl batter (உளுத்த மாவு) into a large container. Now grind soaked rice using the wet grinder into a very fine paste. Transfer the rice batter (அரிசி மாவு) to the same container. Add salt, mix dhal and rice batters very well. Allow the batter to stand overnight or at least for eight hours. Next morning, mix the batter well. Add water, if required, to make the batter into pouring consistency. You may refrigerate the batter and use it to make dosas as needed. Note: Use a larger container to hold the batter overnight, as the batter will rise (மாவு பொங்கும்) when fermented. Dosa batter consistency should be slightly thinner than idly batter. Grind rice into a very fine paste for dosa. How to prepare dosas: Mix the batter well before using. Heat the tava on medium flame. Once ready, spread the batter evenly on the tava. You may make the dosa slightly thick or thin and crisp. Add oil around the dosa and allow it to cook for a minute. When cooked bubbles will appear on the surface of a thick dosa. If you are spreading the batter thin, wait for the dosa to become golden brown. Turn the dosa over and cook for short while. Remove from the tava and serve hot with chutney and/or sambar.